Earlier this summer, I went back to the little theatre that I trained in, the very same one that hosts my Shakespeare Camp. My director has kept photo albums of the last twenty years of shows and, with two of my (used to be campers but now assistant directors) children in tow, I opened these albums. I showed them pictures from shows I'd heard about, shows I'd seen, shows my husband was in before we met. When we came to the shows I was in, it was like stepping back in time. 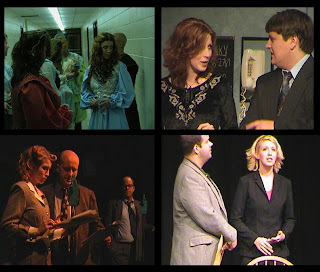 I have such distinct memories of this short stretch of years--the names, the faces, the lines I learned, the costumes I wore, the way I felt before taking the stage each time. It was a thing kind of like magic. An era of my life, shared with two people I love, collected by yet another person I love in a few neat photo albums. Looking at the pictures, I wondered what I might go back and tell that AshleyRose and the people around her. Would I, for instance, tell the AshleyRose in the bottom right picture that the guy next to her would become one of her dearest friends? Would I tell the guy standing directly behind that AshleyRose in the top left picture that he would someday propose to her in that very place? Would that be breaking the Temporal Prime Directive? This is something akin to what Chakotay struggled with in the 7th SSN episode, Shattered. Thanks to a spatial phenomenon, Voyager is split into various (past, present, and future) time zones and Chakotay is the only one who can move between them with his memories of the last seven years intact. It's a bit of a romp (so you know I'm partial) but it's also one of the most surprisingly poignant episodes of any Star Trek series. 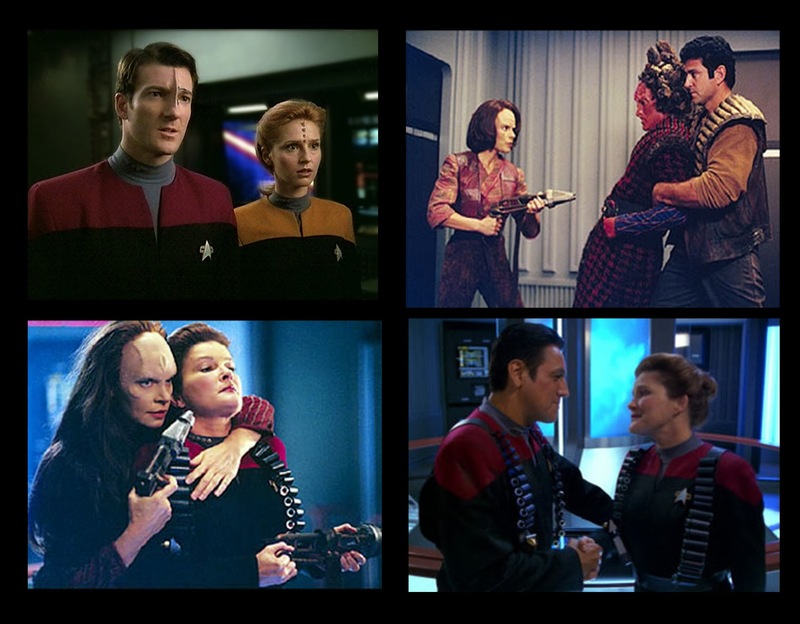 When he takes Pilot-Episode-Janeway (aka Pioneer Lady Janeway) through the timezones and, thus, through the events that they lived through together, he struggles with how much to tell her. How much should he say about their life together? How much could she possibly appreciate hearing about the two aliens they took in after the Caretaker incident? Or that a half-Klingon maquis soldier would become her Chief Engineer? Or that a crude medical hologram would become not only an amazing doctor but a trusted friend? How much could she possibly appreciate how betrayed they would all feel when Seska first left their crew and then returned to take over Voyager? Could she even imagine how awesome she would be when a ginormous virus attacked the ship? Or that this band of misfits, stranded half-way across the galaxy, would become the closest crew--the closest family--in all of Star Trek? 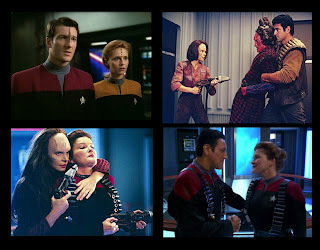 Pilot-Episode-Janeway can't appreciate it. But we can. And that's the point. Shattered is an episode that catches me by surprise. I laugh through the first 3/4 of the episode and then Chakotay (this is really a credit to the writing, directing, and the very under-appreciated Robert Beltran's acting) gives a speech about his time on Voyager and I'm suddenly sobbing into my Dr Pepper. I watch this episode and I think about going back and telling Renaissance-Dress-AshleyRose about her future life, the fun she'll have, the man she'll marry, the books she'll write, the friends she'll make, the places she'll go, the Year of Star Trek she'll watch. She won't appreciate all that stuff. But I do. To me, Chakotay is one of the most charming characters in all of the Trek series. Lots of revealing dialogue bits in this episode. Your appreciation for the heart & soul of Trek is delightfully witty, and touching. I looked at some earlier entries and loved the vlogs, the one from May especially--sensitive, beautiful, wise.